"Bullets ripped the dirt up all round me but none of them were marked Black Jack." -- George 'Black Jack' Vowel. Carmichael's curiosity about her grandfathers, George "Black Jack"; Vowel, an American-Canadian, and Charles W.C. Chapman, led her to afford Black Jack a Twitter account of his own, @blackjackvowel and #albertaWWIsoldier. 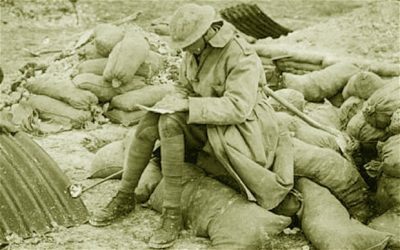 Around Remembrance Day she posted in his name on Twitter and Facebook - as if he were posting from the trenches of Flanders, Belgium and France. 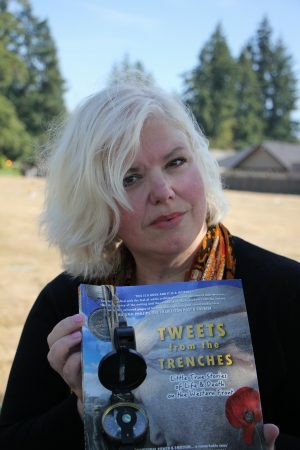 Increasingly she was able to gather details of what it was like to serve as a soldier in the Allied Forces during World War I.
Carmichael is a Port Alberni journalist whose work has appeared in The Dallas Morning News, Toronto Sun, Entrepreneur Magazine and the Westerly News (where she was the publisher). Tweets from the Trenches: Little True Stories of Life & Death on the Western Frontis available on Amazon as well as at select bookstores.